We’d love your help. 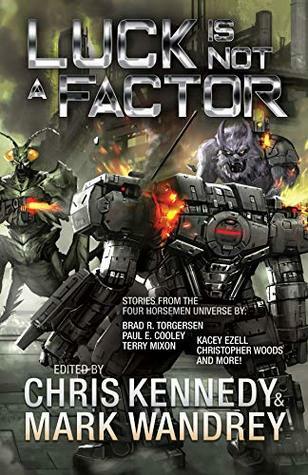 Let us know what’s wrong with this preview of Luck is Not a Factor by Chris Kennedy. It’s the Twenty-Second Century. The galaxy has opened up to humanity as a hyperactive beehive of stargates and new technologies, and we suddenly find ourselves in a vast playground of different races, environments, and cultures. There’s just one catch: we are pretty much at the bottom o Nineteen outstanding authors. Nineteen extraordinary stories. One bestselling universe. To ask other readers questions about Luck is Not a Factor, please sign up. The books keep on getting better and better. From space opera, trickery, to the emotion of a widow at her husbands at her husbands funeral, and later when her sons pass the Vows. It was wonderful to find out how the Golden Horde split from its its drug dealing predecessor and became a matriarchy. Excellent stories that advance the story arc. Another anthology from the 4HU and possibly the best yet,there are an amazing variety of tales though I must confess that A Token of Affection and To Save the World are my personal favourites because they add depth to the initial 1st contracts and the Depik both of which are favourite topics,but there is a tales for everybody. A fine addition to the universe. Many of the stories are continuing characters and story lines from earlier books. There are some new characters mentioned. All of the authors do a great job adding to the Four Horseman Universe. This book has fairly good editing, and the stories picked mesh well together. These stories really help to continue fleshing out the 4hu and give us background on several new merc companies. We ride alongside them during the highest of the highs, and the lowest of the lowes. Suit up, because its going to be a hell of an adventure. I continue to fall deeper in love with the 4HU and the authors that spawned it. These stories continue to amaze me and fulfill my hopes that they will continue for years. Spend the money, buy the whole series so far, I think you will be pleased. My first proper Scifi book i read at school was Heinleins Starship Troopers and to this day i still love it, this series of the Four Horsemen is just as good. This new anthology brings some new charachters and reunites us with some older ones. 3 stand out stories ore Sattara, A Token of Affection and Caspers Widow!